Things went pretty well. Although I know that I am not going to get any further painting done between now and when I fly out. I got some work started on the next 4 models. The base coat, washing and grey lining is complete. So when I get back in a couple of weeks I will move onto painting the white proper and the rest of the models. So that is it for now. Catch you all in a couple of weeks. And the Tyranids are still being worked on. 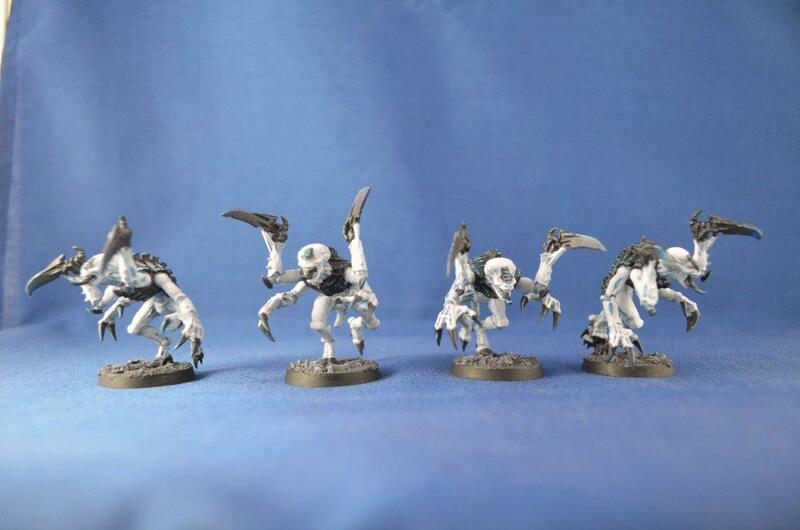 4 more Genestealers are now complete and a lot of Lord of the Rings commentary tracks have been listened to in the last few days. Only onto The Two Towers, but with 4 commentary tracks per movie, it is taking me a while to get through them. I am finding that I am enjoying listening to the tracks though as I am not being distracted by wanting to look up at the movies too often. Next up are some more Genestealers and the Broodlord for the unit. I will make a start on these, but don't think that I will get them done in my time remaining. Still have to pack, finalise my list of places to visit at Gencon and work out the last few little things before I go. Some good timing for me I think. My gaming group has decided to hold an Apocalypse game in November this year. Tyranids vs Marines. 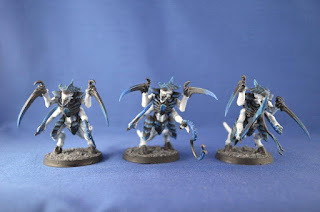 So as I have been painting some Tyranids, I thought that this would be an excellent time to try and power on through them to get them worthy of an Apocalypse game. I am not going to try for anything too over the top with them, as I know myself and my painting speed. However I feel that if I can get to 1500pts or so, I will feel better with putting them down. Or failing that, get at least 3 formations complete to throw down with. So as this was being discussed late last week I spent Saturday assembling and undercoating the first lot of models that I am going to paint for them. 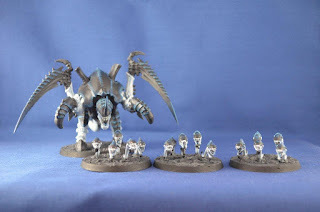 This was some Genestealers, the Broodlord from Deathstorm and a pair of close combat warriors to add to the one that I already have and use as my current Prime to make them a unit of 3. Over the last two days I have painted quite a lot and have managed to complete the two warriors. And here is the now complete full unit of three. I hope to get at least a few of the Genestealers finished by the end of the week when I head out on my holidays. 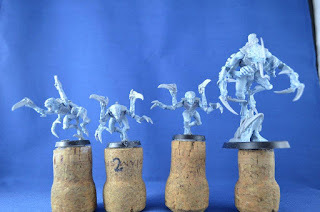 So in this week at home I will be trying to do as much painting on Tyranids as my packing and other things go so that I can head to America on Saturday. So enough about that. I thought that I would keep a log at the bottom of each of my posts between now and the Apocalypse game to see what I can get completed and what formations they make up. Well, I still have not gotten much painting done. Have done a very small amount on some of the Myth undead that I hadn't put brush to miniature to in a while. It didn't go too badly. But still have 5 models to finish in that set before I take some photos of them. I also forgot to take my camera with me when I played the second game of my Eldar versus my Tyranids yesterday. I had the same opponent as the last game, except that we swapped roles, Eldar for Tyranids. The board did have more terrain on it, but not a whole lot more, or at least not a whole lot more in the part of the board that we played on. The Eldar deployed in a line, and the Tyranids deployed in one large block, directly opposite some Dark Reapers and Jetbikes. The first turn was harsh on the Hormagaunts as they took the majority of the fire from the Eldar units and were reduced to a shadow their starting strength. They did make contact with the Dark Reapers eventually though in in two close combat phases took Dark Reapers out for a few more losses. The Rending claws took two turns to take out all of the Wraithguard though as they were too tough for the Hormagaunts to make a dent in. While this was happening, the Eldar guardins and Jetbikes were slowly retreating and trying to shoot up the remainder of the Tyranids. This didn't go so well for them. Well, the retreating part did, just not the shooting. This following up of the retreating Eldar took up a few turns. The Genestealers were all shot up. So were the Hormagaunts. The Farseer took a wound, and the Tyranid Prime took 2. But by the end of the game, the Eldar were in a bind. Only the Farseer and one Jetbike were remaining at the end of turn 7. All in all the game was quite enjoyable. The tally now stands at one win a piece for the Tyranids and the Eldar. Now I just need to get back to painting some Dire Avengers. This doesn't seem too likely to be happening this week though, as I have fallen into a computing pit called Marvel Heroes and I am finding it difficult to get out of. Playing computer games and reading mostly. I have gone back to playing some more Eve Online, some Dead Rising 3 with friends and also some other games that I had from previous Steam sales. This sale I think that I did fairly well and only picked up a few items. One of those was the Lego Marvel Heroes game. I am doing pretty well with it and I am finding it quite amusing. I am very, very bad at it, but I am managing to slowly get through the levels. In reading, I have almost finished a horde of books that I picked up at the last 2nd hand book fair that was held here. I think that this was from February. So a couple of solid months of reading there. Oh, and some Lego assembly. I picked up an Imperial shuttle from Star Wars to assemble which I liked. However it came with a rebel crew, so I assembled the shuttle but ditched the crew into my lego parts box. The shuttle is quite tall, so I am unable to sit it next to my Lego Emperor being escorted by his Imperial Guards. Not sure if that is what they are called, but they are the red robed troops anyway. Will I get back to the painting? Yep. Three weeks until one of the longest holidays I have had since leaving school - 6 weeks off coming up. Looking forward to going to Gencon for the first (possibly only) time and have been planning out my shopping schedule on the map of places to visit. If only I wasn't limited by luggage it would be better, however I guess that means that I will have to shop smarter, not more excessively... That is going to be difficult. It is time to make a start on the Dire Avengers. I am keeping the squad pretty standard. 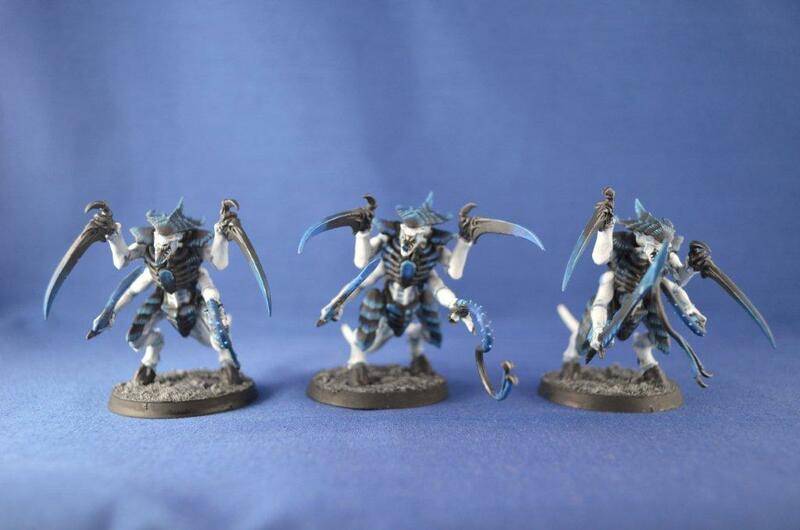 No exarch at this stage, just 5 Eldar with their Avenger weapons. The arms and the guns are again kept off at this stage, as is the head. I am working on the arms and guns at the same time, just was lazy and didn't move them to my light booth when taking the photos. Still pretty early here, as I have not finished the base blue. After a couple more coats of this, I am going to try painting this blue in a similar way to the white that I use for the other models. Which will be giving the models a couple of coats of a darker paint really thinned down, then back to this mid coat then the highlighting. I hope that it should work out. It may not be much different from a base coat, shade, highlight scheme, but it is a small change so I will see how it goes. 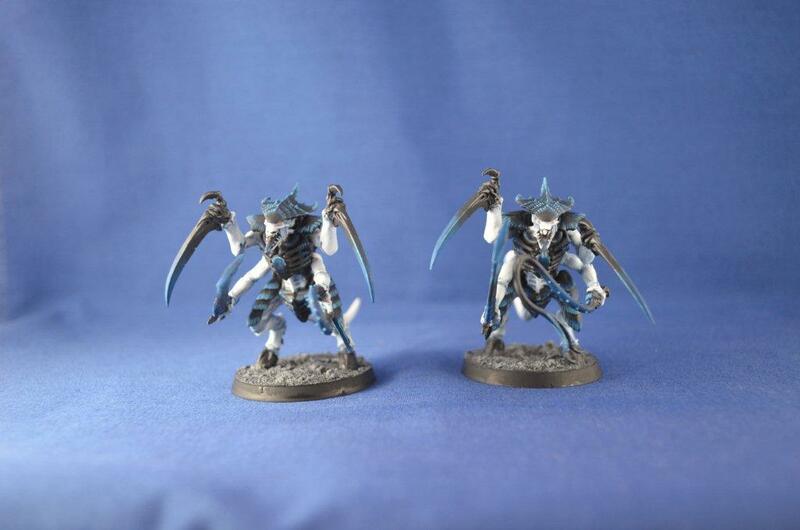 I have now completed the Carnifex and the Rippers. I went with a fairly bare bones Carnifex. Just added the crushing claws so that it becomes strength 10. It does drop it's speed in combat, but it was pretty much going last against most things anyway, so it doesn't feel like that big a loss to me. Also strength 10 will I hope allow it to flip vehicles a little easier and allow it to get to the soft squishiness within. Not that there are any vehicles in the forces that I am currently using, but that may not always be the case. With the rippers, that properly completes the first box battle force box that I purchased a while ago. This is good as it is the first group of that size I have completed in a while. Length of time to paint not withstanding, that is a good milestone for me to have reached. Yes, there are quite a few boxes to go for my Tyranids (of which there is only one more battle force box), which I will be working through in a little while. 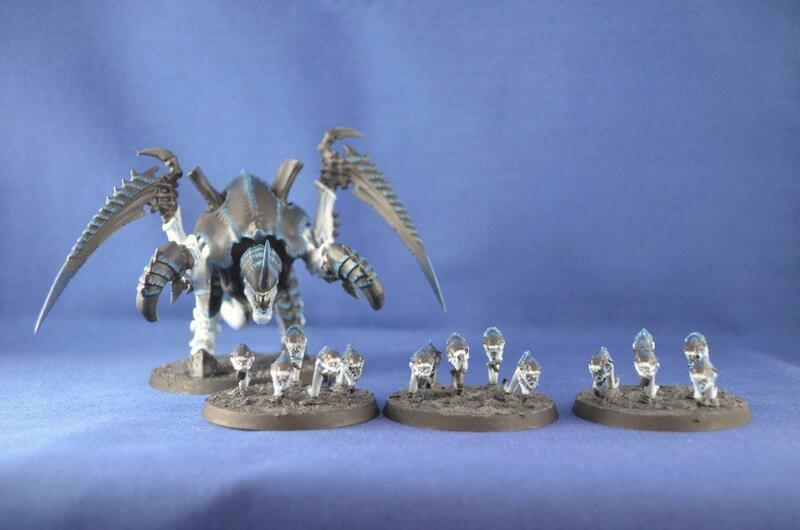 With the completion of the Carnifex, that brings my Tyranid force to 680 points. 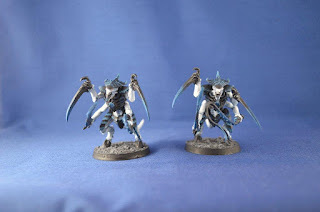 As they now out point my Eldar, I am returning to the Eldar next to bring them up to the same number of points. 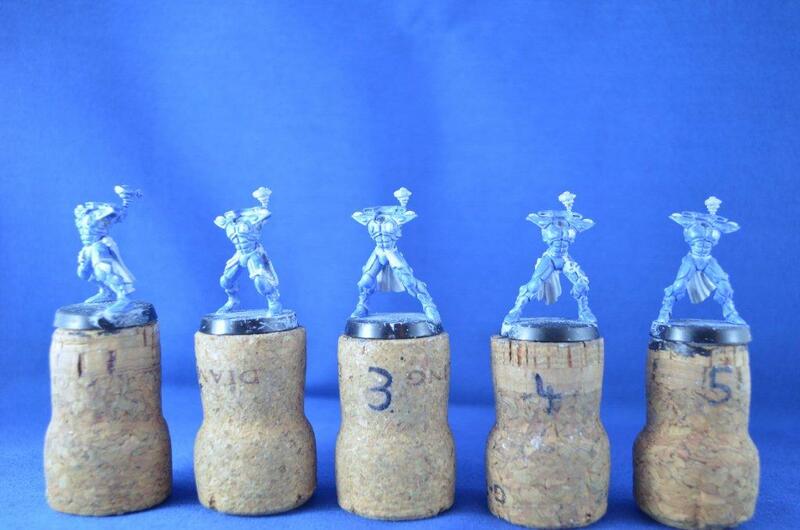 So that means that next up are some Dire Avengers. Also hopefully a return to updating a couple of times a week.